Today, to help our customers plan for the future, we’re announcing features that are planned for the 3.x series of Smart GWT releases and the 8.x series of SmartClient releases. Several of these features are available in nightly builds now, with documentation and samples – see below for details on how to download and where to look. These features will be incorporated into Smart GWT 3.0 and SmartClient 8.2, which are currently scheduled for Q4 this year. Note that these features are just the committed features for 3.x and 8.x – we will be announcing yet more features, and bear in mind it is always possible to influence the roadmap through Feature Sponsorship. Drawing: Create cross-browser, mobile-enabled graphics in your applications with our general-purpose vector graphics library. Works everywhere with no plug-ins required. For more information, see our previous feature announcement on Drawing Cross Browser Vector Graphics. Automatic Joins: Include fields from another DataSource with a single property on a DataSource field causing an efficient SQL join to be used. Supported for SQL, JPA and Hibernate DataSources. CSS3 skins: Existing skins have been upgraded with a ‘CSS3 mode’. CSS3 skins have the same look and feel as current skins on modern browsers, but use radically less media, have a simpler Document Object Model (DOM) for faster rendering, and are easier to modify. Client-side Tree Filtering: Tree components have been upgraded to perform client-side, tree-oriented filtering. Similar to Adaptive Filtering for grids, client-side filtering minimizes expensive server round trips for more responsive searches. Field-Level Declarative Security: Declare that viewing, searching, initializing or updating DataSource fields require specific roles with automatic consequences in the UI. In previous releases you could control access to individual DataSource operations, and now you can control access to specific operations on fields. This enables you to limit access privileges by role to ensure granular security at the field-level. PDF Export: Easily export and share any set of printable components as a Portable Document Format (.PDF) file. *Workflow System: Loadable XML workflow definitions that can handle multiple steps of user interaction and server contact, making multi-step wizards entirely declarative (*This feature is committed for inclusion in SmartClient only for now). HTML5 Charts with mobile support (Licensing): In the coming weeks, we will be changing the licensing requirements to make this popular feature available to more of our users. 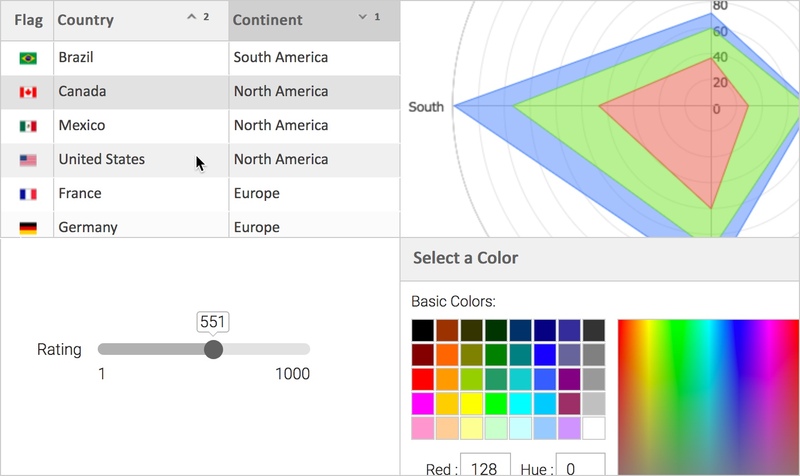 To learn more about Charts, see our previous post on HTML5 Charts with mobile support. Field-Level Declarative Security has several interlinked documents in the reference docs. viewRequiresRole links to all the other properties. DataSource.viewRequiresRole is a good starting point. Although many of the other features are functional, for now if you’d like to begin working with them we recommend signing up for a Jump Start program. As always, please send us any bug reports or feedback in the Forums. Please be clear about which product and version you are using when reporting problems. Download Smart GWT 3.x or SmartClient 8.x to get started using these new features today! 3.x will be a paid upgrade for 2.x license holders. If you just bought a 2.x Smart GWT license, don’t worry, upgrade costs are based on how recently you bought. If you bought very recently, you can get access to the entire 3.x series for a fraction of the license price. For a quote please contact sales.